Try using a steeper swing to get out of a bad lie. Ending up with a shot from a bad lie might mean that your previous shot was way off the fairway, or it might mean that you landed in a divot. 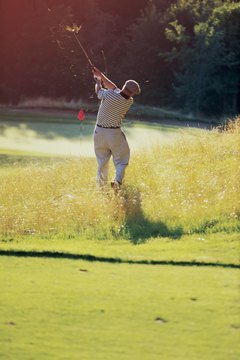 In any case, we all eventually have to deal with hitting from a divot, bare ground or deep rough, and learning to hit this type of shot can take strokes off your game. Your goal here is to hit the ball to a good position for the next shot. To help accomplish this, steepen the angle of your swing. Remove any debris such as leaves and twigs that may surround the ball. Keep in mind that according to the rules of golf you should not move the ball or cause the ball to move while removing debris. Choose the right club to get you out of a bad lie. To get the ball up into the air, use a lofted club like a pitching wedge or a 9-iron. If you are going for a “punch” shot to avoid overhanging trees or the like, take a club or two more than normal. Address the ball in a normal posture with your hands ahead of the ball. The ball should be in the middle or toward the back of your stance. To hit with a steeper angle to your swing, your left arm will form a direct line to the ball as you lean forward slightly. Set your wrists earlier in the takeaway. Your body will be coiled over your right knee as you shift your weight back slightly. This will encourage a strong, steep swing. Keeping your left hand firm, bring the club down on the back of the ball at impact. Your weight will shift to your front foot and your head will remain centered over the ball. If you are hitting out of deep rough, don’t be afraid to power the club head through the ball. How Do I Hit a Golf Ball With Backspin?